This week, Florida Travel + Life Magazine named Destin as one of the three best places to get on the water in the Florida. In addition to the famed deep-see fishing, the pristine, emerald green waters offer an array of recreational activities from sandbar parties at Crab Island to dolphin and sunset cruises. Getting on the water has never been easier or more fun than with the SunVenture. The SunVenture cruises daily for dolphin / sunset cruises, Crab Island excursions, Harbor Fireworks Cruises and private charters. Upon embarking on the SunVenture I, guests will be immersed in custom Guy-Harvey ocean-inspired artwork throughout the boat, indicative of the scenes they will experience on the water. Coast-guard licensed captains give patrons a narrated cruise through the harbor before heading out to the open waters. The close proximity to the water and open-air sky deck offers SunVenture guests the closest views of the dolphins on an hour and half narrated and educational cruise. The flexible cruise schedule offers dolphin cruises mid-morning as well as during the beautiful sunset hours. 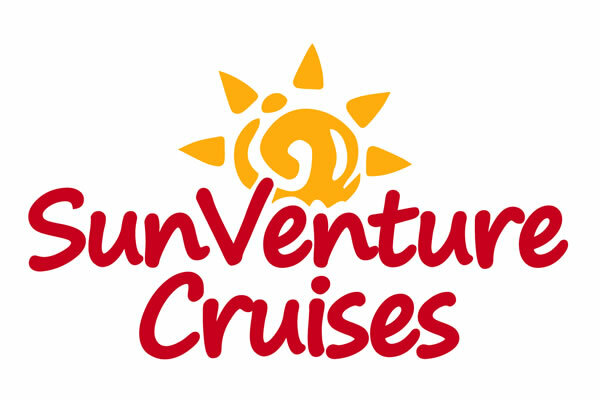 The most popular cruise option is SunVenture’s Crab Island excursions. Located at the Destin Bridge, Crab Island is a shallow sand bar where locals and visitors alike anchor their boats to play and relax in the pristine emerald green waters. SunVenture’s Coast-guard licensed captains charter the three and a half hour cruise so guests can enjoy a worry-free day on the water. Every Thursday, the SunVenture sets out for a magical evening on its Harbor Fireworks cruise. This one hour cruise explores the Destin Harbor and offers guests the best seat in the house for fireworks as the sky above them illuminates with bright colors. SunVenture’s private cruises in Destin offer the boat and the captain for any group up to 49 people. The catamaran features a state-of-the-art sound system, open deck, event planners and catering options. Many groups have taken their celebrations to the water for a memorable experience, including brunches, bachelor / bachelorette parties, birthdays and weddings. We’re up for any water ad’venture’ you’re up for…..view our schedule of daily Destin cruises here.